You’ve seen us cover a ton of different slow cooker models here on the site, which obviously makes sense since it’s such a popular product category. But perhaps you’re not entirely convinced that these kitchen gadgets are as great as everyone says. Well, now is your chance to find out without spending a lot of money. 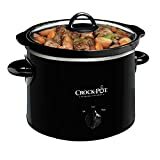 And when we say “without spending a lot of money,” we mean it quite sincerely — the Crock-Pot 2-QT Round Manual Slow Cooker is somehow on sale on Amazon right now for less than $10. It doesn’t have all the bells and whistles that automatic and multi-purpose slow cookers do, but it’s the perfect way to dip your toes in the water before you dive in.